The way Yogg-Saron works is that when it’s played, it casts one spell with a random target for every spell you’ve cast prior in the game. This isn’t limited by class, mana, really anything. Yogg will play what Yogg wants to play, and chance will take care of the rest. It might play a massive Pyroblast and send it right at the enemy’s face, or it might turn itself into a sheep, ending the magic spree and leaving you with a measly 1/1 on the board. Thijs’ Yogg needed to clear four tough minions, and leave him in a state to win the game before his opponent could eke out the one damage needed to win. Somehow, some way, it worked. A Frost Bolt takes out one minion, but Volcano ends up being the real hero, doing the bulk of the damage to the board with its 15 damage split randomly among all minions. (Yes, the patron card of random summoned a card that does random damage.) 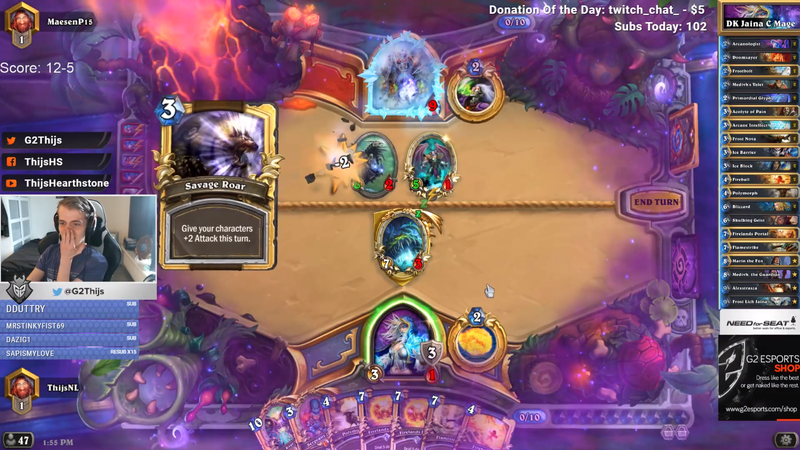 A Siphon Soul and Slam finished it off, and Thijs ran away with a clean board and an Ice Block, which would block any possible fatal damage the next turn. To add insult to injury, Yogg-Saron was not originally in Thijs’ deck. He was running the new card Marin the Fox, and had received a Golden Kobold from his treasure chest when he played it. The Kobold replaces your hand with Legendary minions when you play it, so the randomness was also obtained through random draw. That is Hearthstone in a nutshell.